I have had three grandmothers in my life and they couldn’t be more different. One I barely knew as she had dementia and lived in a nursing home most of my life. One is still alive and is extraordinarily prim and proper. The last time I ate breakfast at her home, she removed the jam from four different jars and put them in special bowls each with its own particular jam spoon. I ate at her home seven different times on that trip and we never used the same dishes. I can’t imagine how long it would take for her to have to repeat a dinner plate pattern. I loved it! And the third one, who was also my favorite (shhh – don’t tell anyone) was the kind that would buy a flocked white Christmas tree and cover it in miniature Chinese lanterns and glitter red apples for no particular reason. She also taught me how to cut school and play Uno and she introduced me to grilled cheese sandwiches and bagels. Ok – so maybe we didn’t cut school – I mean I was only five when she lived with us, but in my memory everything we did felt like an adventure, a scandal, a romance of the ideal kind. So when she came over one day with a big green football looking fruit, I was anxious to give it a try. It smelled weird and looked weird and she wouldn’t let me eat any of the slices. I waited until the she got down to the very pit and she handed me the slimiest, slipperiest piece of fruit and told me to grab some napkins and eat it like corn on the cob. The task was impossible. Fruit got everywhere except my mouth. The dripping juice went up my nose as I tried to wrestle with it. At one point we were laughing so hard that the seed slipped out of my hand and flew across the floor like a penguin diving across ice on its belly. I’m pretty sure that I have been deeply in love with fruit ever since. I’ve had many excellent mangoes in my life since that day. And while this Keitt Mango isn’t my most favorite, it is certainly the best I’ve had any time recently. The texture is absolutely luscious and these days, that’s worth a lot. Mostly grassy green skin with slight yellow blushing on the ends. Sunflower yellow/orange flesh and a single large seed. Uncut they have no discernible scent. Once cut they have a slightly tangy and pleasantly fermented scent. Faintly tropical. Juicy and dense. 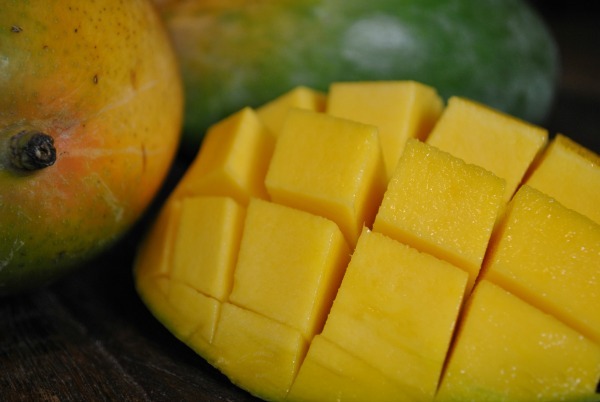 The absolutely ideal mango texture. NO stringiness. Woot woot! Sweet and straightforward, mellow mango flavor. Little acidity. All four of the Keitt mangoes I received had perfect texture — even the one I left on the table a little too long. Just fantastic. The taste is mellow and excellent, though I prefer a mango with a bit more assertiveness. I would reach for one of these any time since I’m guessing they are very consistent. What variety of mango is your favorite – Kent? I’m actually not sure Faye. I used to live in Hawaii and I had a number of mangoes right off people’s trees that were phenomenal. No idea what the varieties were.